The main draw of the singles events started today, and there were numerous upsets. Table Tennis legend Waldner was beaten in the first round, and Chinese 18-year-old Qiu Yike played the challenger role successfully to show Boll the exit after the second round. Li Nan also became the first Chinese player to be eliminated. In second round action, Qiu played world-ranked number one Timo Boll. Qiu is an all-round player, with great balance of forehand and backhand. He is playing the spoiler role in this tournament, and Cai had praised Qiu's never-give-up spirits earlier. As the number one seed, Boll is of course a very strong player, and was targeted by the Chinese team as the biggest opponent. Boll had said that he could beat any Chinese except Ma Lin. In this match, Qiu played all out with no pressure, and executed to his level. His steady defense and ferocious attacks matched up very evenly against Boll's skills. Although he fell behind 0-2 in games, he played calmly, and pulled up to a 3-2 lead. In the 6th game, Qiu, now anxious to win, committed several errors, and fell behind by a large score. Trailing 5-10, he refused to give up, and scored the next 5 points to force the deuce. Boll now appeared to have lost his confidence, and lost the next two points to Qiu who won 12-10 and 4-2 in games to score the biggest upset in the tournament. Qiu also removed one of the major obstacles on the Chinese path to victory in the men's singles event. After the match, Boll, showing great sportsmanship, extended his congratulations to Qiu. He said, "Qiu played like a champion today, and I was beaten by his great spirits. Since game 3, every time when a critical point was played, I found it hard to concentrate. I don't know why; I always thought that I was mentally very strong. But Qiu was the stronger one today." Finally Boll said that no matter what the outcome was, they played a very exciting game. In the first round, Boll faced a Dominican player Jin Ju who was a member of the Chinese 2nd national team, and had to fight a tough battle to win 4-2. 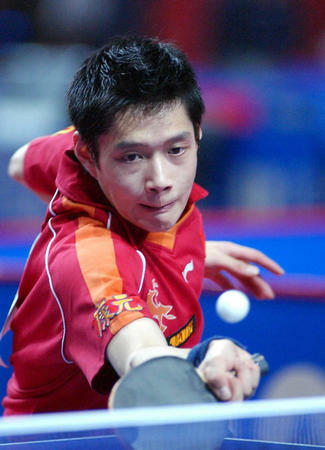 Jin was in the same group of players as Tang Peng, and is good in combining topspin attacks with backspin defense. Boll later said that he practiced with Jin before and he remembered him. He also thought that Jin was a great warm-up for himself. Reporter: Before the match, everyone knew that Boll was the stronger player, but you emerged as the winner. What do you think are the reasons why you won? Qiu: First of all, I was not afraid of Boll. And then, very importantly, coach Cai prepared me very thoroughly on how to play Boll. There were some very detailed planning of the various tactics, and they were the most important reasons why I won. R: You fell behind quickly 0-2 in games. What went on in your mind? Q: At that time I only wanted to win one point at a time. Actually there was no advantage in thinking too much. R: This is the first time you play in a major tournament, and you beat the top ranked player. How do you think this would affect your career? Q: I am still young, and I am very fortunate to have this kind of experience, especially playing someone as good as Boll. I will benefit from it. This kind of match adds to my overall experience, and is a good test of my ability to mentally withstand the pressure and to execute at a fine level. I think this victory will make my future path easier. R: Some people think of you already as representing the next new wave. What do you think? Q: I can only play the matches one at a time. Everyone I face will be at a higher level than mine. I just have to do my best. R: Did you think that you would beat Boll? Q: Of course, otherwise I would have no confidence. R: When you won the last point, were you very excited? Q: I did not feel anything particularly different, and I was not too excited. R: When you were behind 6-10 in the last game, what adjustments did you make? Q: I felt that my back was against the wall, and that I might as well play all out. R: You mention those tactics the team came up with against Boll. Can you tell us more? Q: No, I have to keep those a team secret. R: When in the match did you feel you could win? Q: When the score was 2-2 in games. R: Did you see the Chinese fans cheering you on? Did you feel nervous? Q: Yes I saw them, and I was a little nervous, but not too much. R: The German fans were very loud, too. Did that affect you? Q: There were some effects on me, but I think the effect on Boll was greater. Qiu's coach on the court, Xiao Zhan, told reporters that Qiu still lacks experience, and that he was not able to play at the proper level earlier. That was why he fell behind. The 3rd game was the turning point, and winning that help stabilize Qin. The problem with Qin is mainly confidence. The tactic plans the team prepared were effective. Cai said that in the overall picture, Qiu's victory is just one victory. This is not a critical match, and the team has to play the next matches one at a time. At the end of today (May 21) Cai held a small press conference. Cai said that this had been a tough day. Fortunately Qiu beat Boll, and most of the other matches went as expected. "Regretfully Liu Guozheng and Tang Peng lost in men's singles, and Li Nan lost in women's singles. There was also a mixed double pair that lost. Mainly Li Nan lost because she was not in good condition, and there was still some effect from the Asian Games. There were also problems with her new equipment, and her mental state. In the later games she played acceptably well, and overall she tried her best. The problem with Liu Guozheng is technical. He was over conservative, and did not use his new backhand skills. And he also lacked confidence in himself. Tang Peng lost mainly because he was young and nervous. His specialty is his speed, and if he is not confident, he will not play to his strength. "The losses suffered by Waldner Gatien and other older players showed that their techniques are outdated, especially among those who depend on their serves. From a competition point of view, the table-tennis techniques are still developing. Mainly the backhand attacks are getting stronger. The young players, including Boll, have great ability to score with their backhands. We are also working on improving this, for example with Ma Lin," Cai said. As to why Qiu was able to beat Boll, Cai said that the team paid the most attention to Boll, prepared the most against him, and also understands his techniques well. So the team can anticipate what Boll does. "There were two reasons why Qiu fell behind early. One is that Boll has made some changes in his serves, and Qiu did not see them in the beginning. Secondly, Boll is applying more spin in his first shots, and Qiu was not used to that. Overall, Qiu won because he was strong mentally, and able to crawl back a point at a time when he was behind. Even though Qiu wanted to win too badly in that last game and started making errors, those were fairly minor problems. Boll has a very strong backhand, but Qiu played close to the table, and was even quicker and spinnier. Qiu played with aggression and took risks, and that caused Boll to have problems transitioning from backhand rally to attacks. Qiu's victory is not just a personal victory, but is an overall blow to the Europeans. This took away momentum from the Europeans, and raised the Chinese team's spirits. I hope that will continue with tomorrow's matches," Cai told reporters. "Boll, Samsonov and Chuan will still be the main opponents of the Chinese for the next three to five years. They have the skills, the specialties, and the experience with the Chinese to stay competitive."